The nearby interacting "Antennae" galaxy pair (NGC 4038/39) is one of the best-studied local systems of merging spirals, offering an ideal laboratory for galaxy evolution models. They are located at an approximate distance of Mpc in the southern constellation of Corvus and their first discovery dates back to William Herschel in the late 18th century. First optical images were taken by Perrine in 1922 and Duncan in 1923. Later they were identified as being interacting galaxies, e.g. by Holmberg (1940) and Minkowski (1957). They were also cataloged as "Arp 244" in the Atlas of peculiar galaxies (Arp 1966). Here we present a high-resolution, self-consistent numerical simulation of an 1:1 Antennae merger model, which we compare to VLA HI mappings of the Antennae ( '', ) by Hibbard et al. (2001). The use of HI is advantageous in this case as we can use it as a tracer, sensitive to both the morphology as seen in the plane of the sky and the line-of-sight dynamics of the system. Initially the galaxies move on Keplerian orbits with peri-centric separation kpc and initial separation of one virial radius kpc. The simulation is run using the fully parallel SPH code Gadget-2 (Springel 2005) with a total number of particles, including the star formation model by Springel & Hernquist (2003). In the picture of the month we see projections of our Antennae model at the time of "best fit", which we obtain at a time shortly before the second encounter. This means Myr after peri-centre and Myr until final merging. We see three projections in the a) X-Z (plane of the sky), b) X- and c) -Z. 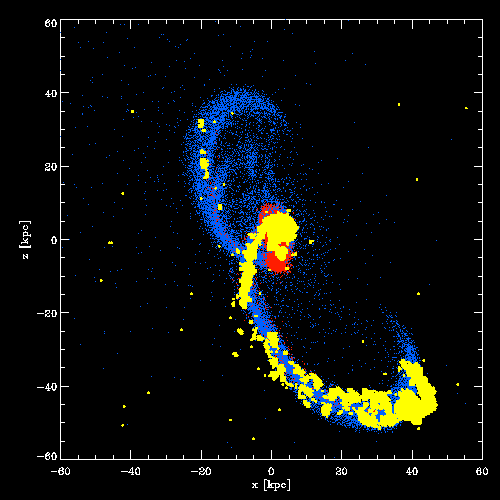 Only gas (blue) and newly formed star (red) particles are shown and compared to observational data (overlaid in yellow). This is the first step needed to allow for a detailed theoretical study of the various interesting physical properties in this merging system. For further reading also download my PDF.